We aim to relate and develop various approaches to a theory of domains in a realizability framework. In the first part we develop the theory in an arbitrary partial cartesian closed category and, as a particular instance, in the category of partial equivalence relations (per) over an arbitrary partial combinatory algebra (pca). In this way one obtains the category of separated pers that may be regarded as a universe of partially ordered sets and monotone maps with strong closure properties. Pursuing the analogy with domain theory one tries to build a category of directed complete partial orders and continuous maps. We consider two main approaches: one based on Kleene's pca of numbers and partial recursive functions and the other based on Scott's D ∞ λ-model. Contents: 0. Introduction, 1. Dominance and Intrinsic Preorder, 2. Separated Partial Equivalence Relations (Σper), 3. N-completeness, 4. Σ-connection and Extensionality, 5. D-completeness and Uniformity, 6. Conclusion. A preliminary version of this paper appears as LIENS-TR 19-90. Work done while on leave from: Dipartimento di Informatica, Università di Pisa. 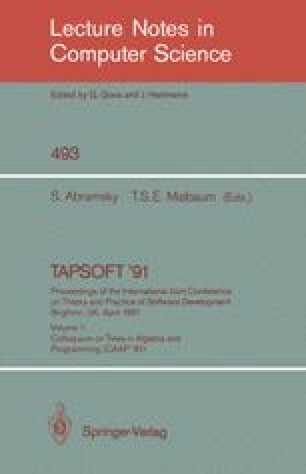 Research partly supported by the Joint Collaboration Contract "Typed Lambda Calculus" of the EEC and by the Basic Research Action "Categorical Logic in Computer Science" of the EEC.